A nomad of Europe for years, I enjoy very much being born in Tuscany, and I’m proud of having introduced many people from all over the world to the Palio of Siena. For many of these people Siena's Horserace revealed itself to be the same as for the Sienese; a beneficial addiction, never to be missed. Attending the Palio can be both uncomfortable and expensive, but it’ll always be a unique experience, and a source of great inspiration and admiration for whoever approaches it with the right mind set and curiosity. And beside this, Siena's ancient Horse Race will probably turn out to be most exciting event one can attend. 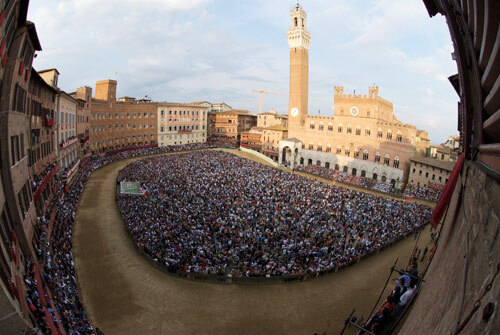 It takes a real insider to find (good) Palio tickets, and to offer truly interesting Palio tours. After many years in and around Siena, I know the Piazza del Campo in all its secrets and all Palio viewpoints in depth, exclusively managing the best ones. Be them balconies or grandstands, windows or terraces. And I can crate some truly Palio insider packages, with otherwise sold-out hotel rooms in central Siena, the best guides to access selected places where defintely not many other tourists have gone before. Your Palio experience will vary very much according to your selected viewpoint. Still, what really counts is your awareness of not just coming to watch a show, rather the reality of you being guest of an experience of which you can be part, if you want to. This is the more specific Palio viewpoint which I’m pleased to be able to offer. Be there, but without the crowds.